Car maintenance can be expensive. Instead of ignoring these problems there are some things that you can do to save money. These are 10 car repairs you can do yourself to save money and make sure your car is getting the car that it needs. The air filter is not difficult to replace. If the filter is clogged it can reduce the performance level of the car. Changing the air filter can help the car get better gas mileage. If the filter looks worm out all you need to do is purchase a new one and put it in. The car should be cooled down before your drain the oil. This will require some basic household tools. You will drain the old oil out of the car and then fill it with the new oil. Be sure to read the manufacture’s book that came with the car to make sure you are using the correct oil. If the spark plugs look work than it is time to change them. New spark plugs can allow the car to get better gas mileage. Spark plugs are inexpensive to buy and they only take a couple of minutes to replace. If the windshield wipers look worm out this can be very dangerous when traveling. According to carcareninja, if the rubber looks worm than it is time to replace them. When you go to purchase new wipers be sure to look up the make and model of your car to make sure you are purchasing the correct size wipers. You may need a screwdriver. Your old wipers can be removed and some of the new wipers may only need to be snapped on. When the headlights bulbs burn out and they do from time to time this can decrease visibility. This can also be a safety hazard. As long as they are not sealed in place this is an easy fix to do at home. You are going to need to purchase new bulbs but they can be found in many auto stores. This easy fix will save you some money. If the battery is dying the car will not start. Make sure the car is off and then use a pair of pliers to remove the old battery. Put the new battery in the car and put the positive wires where the positive charge is. Once they are tightened do the same with the negative side. To make sure they are installed property , turn the car on. If is starts than the battery replacement was successful. If the radiator fluid is old it is not performing the way that is should. Make sure the car is properly cooled down before even looking at the radiator fluid. Once the car is cooled down go under the car and unscrew the cap for the radiator and allow it to drain. Be sure that you have a bucket or other item to capture the old fluid. Once the fluid is drained put the screw back on. Pour some distilled water in the radiator and it will help remove calcium deposits and corrosion. Turn on the engine and put the heater on the highest setting. Allow the car to sit for 10 minutes. Allow the car to fully cool down again and unscrew the radiator cap. Allow the water to drain. Once it is drained replace the screw and fill with coolant. Brake pads need to be replaced in order to make sure the car stops quickly. Brake pads are easier to replace than you may think. You are going to have to jack the car up and make sure that it is secure. You are going to need to take off the brake caliper and remove the bolts. All you do then is remove the old brake pads and put the new ones one. They need to be secured and be sure they are clipped in. Once you know they are secure you can put the caliper back on. You will then have brakes that are new and work properly. Fuel filters can protect the engine from damage so it is important that they are replaced annually. Find the fuel pump that is located on the fuel box. Start the car and pull the relay out. This will help reduce pressure. Disconnect the fuel lines from the filter. Using a wrench turn until the bolt comes out. Remove the fuel lines. Repeat this on the other side of the filter. Take off the hold filter. Many are fitted in and a screwdriver may be needed. Make sure you put the new filter in correctly. Bolt everything back in place and make sure that the fuel pump is once again attached. Start the car and everything should run correctly. Low tire pressure can have a negative effect on the handling of the car and can even reduce gas mileage. A tire pressure gauge looks like a pen and only costs around $1 to purchase. To check the tire pressure remove the valve cover and put the gauge on it. Within a second the gauge will give a reading. If the tire pressure is low than you should go to a gas station and add air. Be sure to look at the manufacture’s book or the side of the driver’s door to find out how much pressure should be in your tires. Looking for more ways to save money each month? Check out this huge list of 76 Easy Things You Can Do Right Now. These are some of the do it yourself car repair and car maintenance things that you can do on your own to help you save money. You need basic tools such as a wrench or a screwdriver. 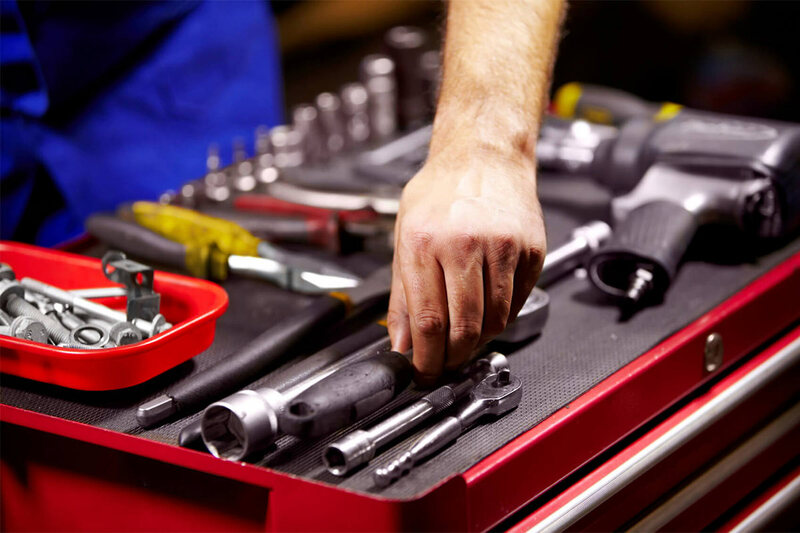 All you need to do is purchase the new parts and with these basic tools and some car knowledge you can make repairs at home and save yourself a lot of money.